Week 19 – Moncao to Home – Do your dream! After a noisy night in Moncao we said goodbye to Portugal and headed into Spain where instantly the sun vanished and we had rain set in for the day. Avoiding motorways as usual, the trip north had surprisingly few nice sites with most towns looking poor and industrial/agricultural and indeed as if they were cloned from East Germany. Of course the rain and low clouds didn’t help, and so we headed to Noya with a view to tour the small coastal villages on the NW of Spain. Noya would probably have been okay but with torrential rain we just had lunch and didn’t leave the van and (sadly) opted to skip the NW corner and head to La Coruña where we stayed near the lighthouse. La Coruña was rather a surprise, huge, busy, and complex road system – TomTom did us proud routing us through but we saw few impressive things. The lighthouse is okay and by the look of it there is a small old-town centre, but the rest looks like its lost any original character and there are flat blocks in every direction. One for the fans of modern architecture that is tucked away but not for us. 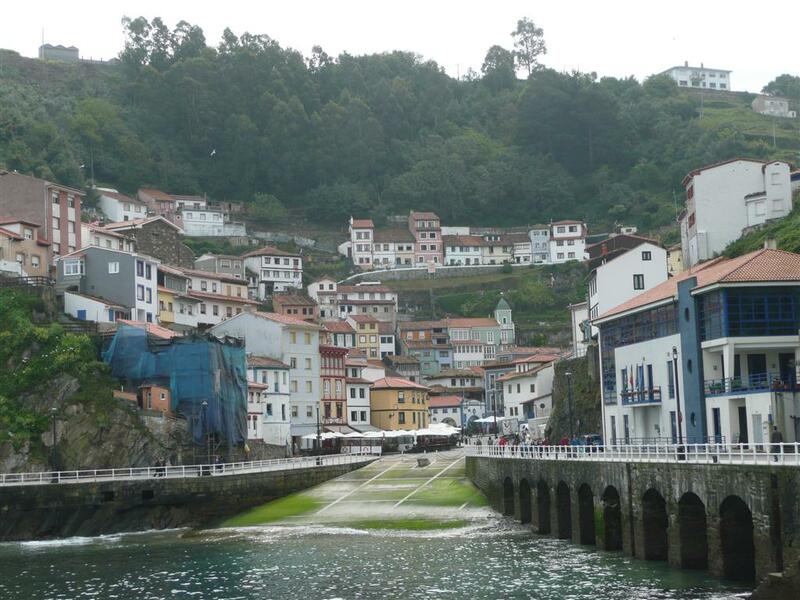 With the coastal roads being very slow, and in the rain not as picturesque as they should be, we headed via quicker inland roads to Ribadeo which we were tipped about and parked for the night in the harbour. We briefly explored Ribadeo in between thunder storms and it was nice enough but it was safer just to tuck in the van for a movie! In the morning the weather was a bit clearer, so we headed for the very pretty coastal town of Cudillero which has a fair few picture-postcard views. One entry to the town is via a narrow walking tunnel with a stream in the middle, and the town itself is c olourful and well worth a visit even if just a lunch stop. The traffic however was chaos and when we left there were dozens of police closing off roads and exits, and TomTom earned his money by giving us a backroad route out of the town. Having motorways suddenly end (due to missing bridges!) doesn’t help and we can imagine the main E70 motorway being hell in peak season. I also guess its Easter weekend? From Cudillero we headed into the national park, and stopped at Cagnas de Onis for some advice on routes. Cagnas seems to be the parks adventure-hub with everything setup from quads, buggys, kayaks, etc etc. We were recommended to take the N625 to Riano and then the N621 back via Potes. We had planned an excursion via the gorges at Cain but it was suggested the exit road was too narrow. 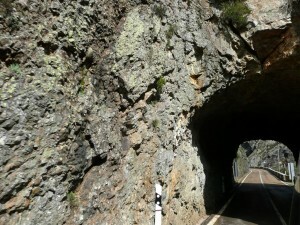 Also the drive, whist not very long in distance took a tiring 4-5 hours without the Cain excursion. 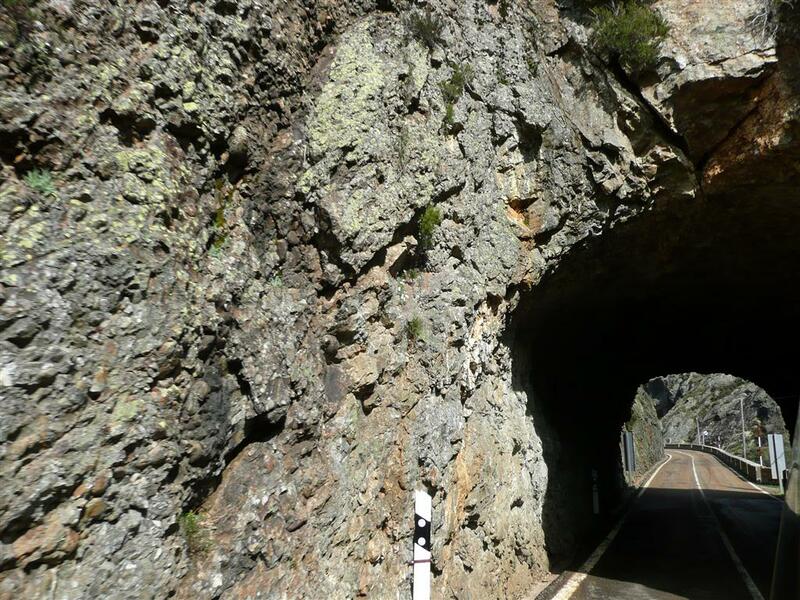 The route was a cross between Scotland, the Lake District, and Gorges-de-Verdon in France. A huge variety of landscapes with some very fun and challenging roads that really wiped us out with even some snow o n the slopes above us. If we had more time we’d have diverted to Posada de Valdeon and checked the road to Cain but after 130 days away time is now lacking. For the evening we made it, exhausted, to San Vicente de la Barquera and stayed in the port and again had a few thunderstorms to contend with. 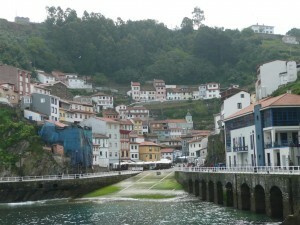 The town though is rather interesting and pretty, and the low bridges connect port to town to beach. One of those places we’d loved to have seen more of if we had more time and better weather and even enjoyed a meal out, but poor Mel was too tired to even look at a menu! But as it was beer and pasta in the van sufficed and we set off in the morning towards Bilbao. Bilbao was pretty quiet when we were there probably due to it being Good Friday, but pretty much everything was closed and very few people were about. The only busy area was the small street area in the NE of the city which was very much like Amsterdam. 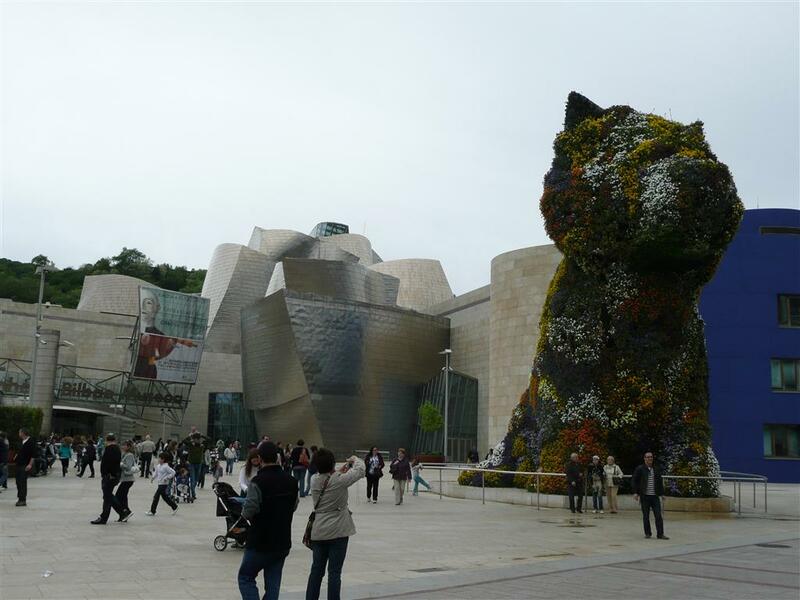 We were slightly disappointed, not with Bilbao itself as it does have a warm feel to it with many nice and interesting buildings, but the weather and lack of atmosphere sort of ruined it. The Guggenheim museum was very impressive with some interesting art work on the outside but we didn’t venture in. After walking the empty streets we cancelled our plans for a meal out and opted for a long/slow coastal drive to San Sebastian. The drive itself was superb – though many lovely places which were Alipine-esque, but all the nice coastal areas were really full! Guess we know where all the Bilbao locals went. Even San Sebastian (which looked really interesting from inside the van) was full to the brim with no parking anywhere let alone for the night, so we decided to cut our losses and we made it to the Spain/France border and just joined a few others hiding in the corner. So we say goodbye to Spain and pretty much head back to UK from here. We’re really sad to say we’ve still not fallen in love with Spain. We have friends who love the country, but whilst we can say we like many parts we’ve never really fallen for i t. This trip has shown us a nicer side than the Costas, but Spain still isn’t for us, and whilst we like Portugal even more we still don’t love the place. Good job I guess as its full of big white campervans and not much room left for us! So a fond goodbye and maybe we’ll return, but probably only after we’ve seen the rest of the world and forgotten what its like. On trying to leave Spain in the morning we were stopped by the armed Spanish police (masked), and then given a load a gibberish (Spanish) – so after they finished we just said “Err – We’re English”. After another load of gibberish and us looking blankly at them saying “English?” they just said “go!”. So tip for terrorists – just look blank at them and they let you through! So after our escape we headed to Couhé – a small and pleasant French village – where there is an aire and a bar or two – but beers at over £5 a pint….? I’m sure we’re in France and not Denmark…? We also went via a Super-U – and either it was really expensive or prices have gone through the roof on food as well – what has happened since we were last here? Our next stop on the way home was a very pleasant town called Châteaudun. You can just imagine the builders “Yeah mate – Chateaus Done” – and the name stuck. 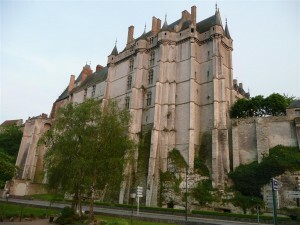 The aire is in a great location next to the chateau and river, and the town with a lovely square is only a short walk away. A rather pleasant stop. Till next time…. Till next trip…. Not long to wait…!